My ambition was to have the AirPort Express set up to extend the range of my main WRT-54GL router; to provide a guest network with easier connectivity (memorable encryption key); and to to connect a pair of speakers to the rest of my AirPlay network. The AirPort Utility is key to the set up process and since I use Linux as my operating system and do not own a Mac this leaves the Windows AirPort Express utility as the route to setup the AirPort Express (as it lacks a web based user interface). 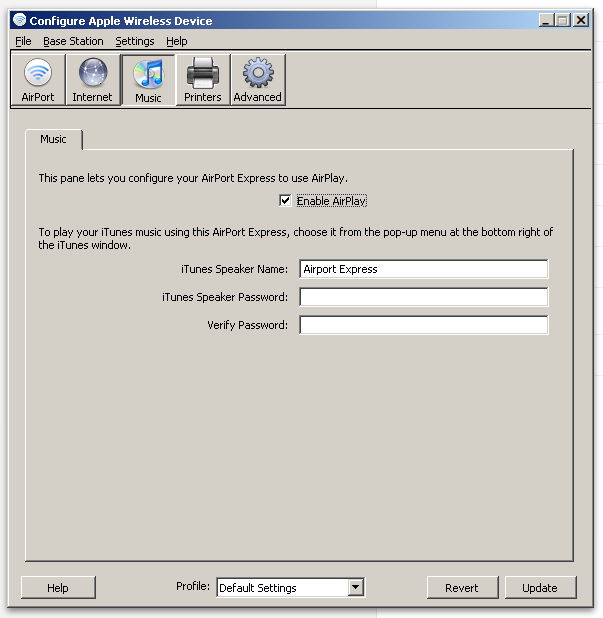 Alternatively you can set up the AirPort Express using an iOS device such as a iPhone or iPad, although in practice I found the Windows utility to be more helpful in customising the setup of the AirPort Express. At the time of writing the most recent version of the AirPort Utility is v6.1 for the Mac, the Windows version appears to be lagging behind at v5.6.1 published 11 June 2012 note this only states support for Windows 7. I am still running Windows XP on my Netbook so I opted to revert to v5.5.3 which contains further updates and supports XP SP3 and above. Airport Utility v5.5.3 also works under WINE. The default options here are to Create or Extend a wireless network, or to turn wireless off. My main router is a Linksys WRT-54GL running DD-WRT which is only capable of a 54G 802.11g connection, the extend option on the Airport Express from my understanding only allows an existing 802.11n network (preferably using other Apple Airport hardware) to be extended. I played around with this option with no success. Notable is the presence of WDS, technically this should allow the existing 802.11g network to be extended since my WRT54G router support WDS. In practice WDS is fraught with difficulty to setup unless using hardware and chipsets from the same manufacturer typically. This is partially due to WDS being a non ratified standard with variances in manufcaturer implementations, due to the potential complexity this present I suspect Apple hid this option (the mainstay of the older 11G based AirPort Express) in favour of the newer 802.11n network extension option. I played around with WDS for a while again without great success. Originally I had hoped to extend the existing network using WDS and then to enable the guest access point and AirPlay on the AirportExpress. Whilst technically possible I couldn't get WDS to work in practice and had WDS worked I expect that the 11G wi-fi performance would just not be acceptable to make it worthwhile. The overhead of extending the wireless network via bridging with WDS would cut available banwidth, couple that with then running a further guest access point and trying to stream music via over the same wi-fi connection using AirPlay would have likely had performance issues on the 11G standard. To compound the WDS issue, I run a strict WPA2 only network and from reading various articles and snippets it appears that the Airport Express may needs to run with WPA not WPA2 to facilitate WDS. I'd gladly be corrected about this - if you know of or can point me to a source where this is not the case since I do not wish to relax my security. 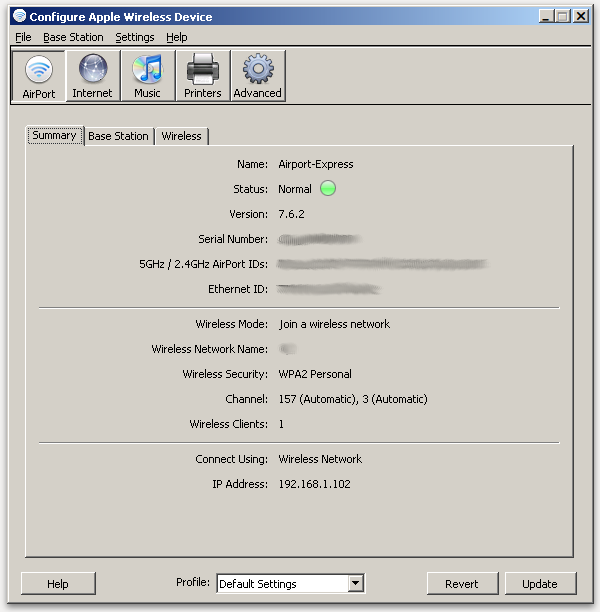 My available solutions were firstly, to run the AirPort Express over ethernet to extend the range of the wireless and to set the AirPort Express up as an access point, guest access point and AirPlay device whereby the 10/100 network cable would provide the backbone bandwidth not available via a WDS bridge. The current layout of my flat does not allow this approach, but eventually this will be my end goal. I opted to join my WRT-54GL wireless network that requires WPA2 encryption. I also enabled 'allow ethernet clients', this will allow devices that only have cable networking to connect to the AirPort Express' ethernet port and to get on to the network using the AirPort Express' wireless as a bridge. I didn't need to touch the Internet tab the settings here were automatically set by the options selected on the prior screens. I had no need to adjust any settings under these areas. Finally I saved the configuration via File > Save Configuration File and stored the resulting config file somewhere safe. The last step was to hit the Update button in the Airport Utility, and then I power cycled the Airport Express to make sure the settings had taken effect. Once the Airport Express had rebooted the status light turned from orange to green to show that it had connectivity to the network. It was recognised instantly by my iPad, iPhone and iTunes. Hooked up to a pair of active Yamaha speakers it works a treat for a kitchen hi-fi. At a later date when I can run ethernet to the Airport Express I will adjust the settings to enable a guest wi-fi access point too, in order to extend the reach of my home network.